Front Rotor Outside Diameter (in): 11.700 in. Hauling or towing--either way, ensuring that you stop when and where you want to stop, that's the name of game! The EBC Stage 9 Kits consist of Yellowstuff brake pads, USR rotors, and caliper lube--everything you need to upgrade your truck or SUV. The Yellowstuff brake pads perform well at a wide temperature range, making them perfect for the daily driver with a lead foot, or the work truck that needs extra stopping power. These brake pads create a medium dust level, but are much less taxing on brake rotors than factory pads. 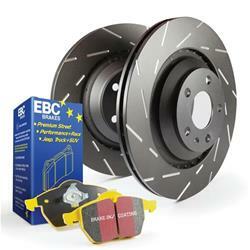 The slotted brake rotors (USR Series) are constructed from gray iron and are designed to EBC's exacting specifications. A GEOMET coating gives the rotors an amazing look, while also protecting against rust and corrosion. And narrow slots on the rotors wick away dust, dirt, and debris, creating a consistent point of contact between pad and rotor.